Most commonly grown in warm climates, Lavandula, also known as Lavender, is frequently used as an ornamental plant because of its striking blue flowers. It’s beautifully scented essential oil is also commercially extracted and often used in bath products, as a potential therapeutic tool and even in the culinary industry. Although one of its main uses is as a fragrance, exposure of the key fragrance chemicals to air, leads to a potential allergen in fragrances. 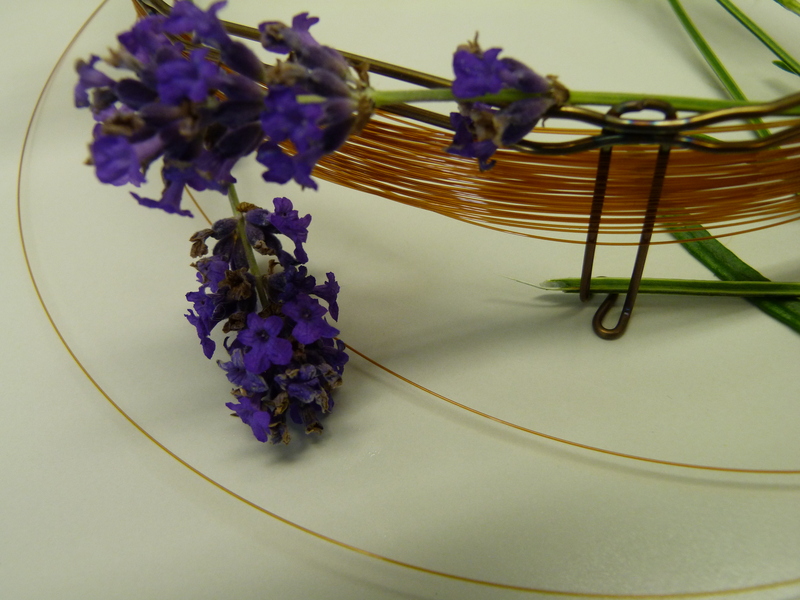 Lavender rests on a gas chromatography column, with a molecule of linalool. 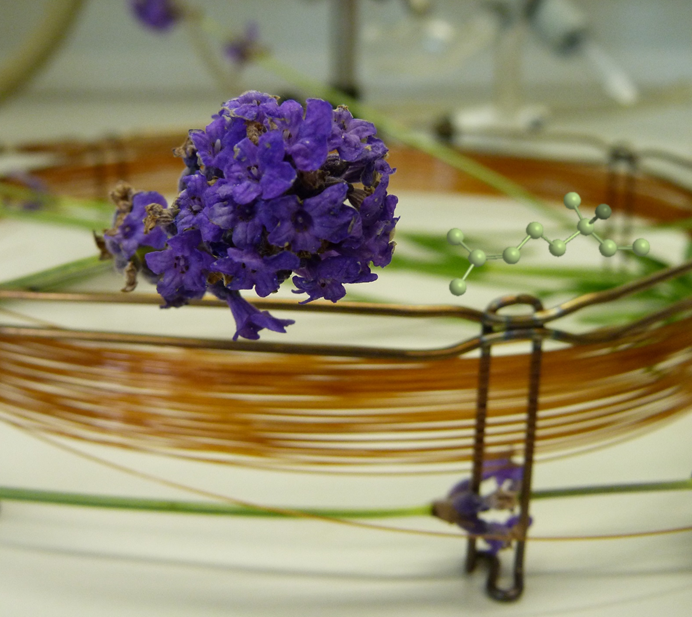 1) In the image above we can see a lavender plant resting on a gas chromatography capillary column. This column is a vital component of the widely used analytical technique, gas chromatography. It is used by scientists to separate components of a mixture and measure their relative quantities. It is very useful when only a small quantity of sample is available or there are numerous components in the mixture. However, the sample does need to withstand high temperatures without decomposing. A molecule of linalool is also shown; this molecule is involved in the fragrance of lavender, but only one arrangement of atoms gives the lavender smell with which we are familiar. The flowering plant Lavandula, commonly known as Lavender, belongs to the mint family, Lamiaceae. There are actually 39 species of lavender flowering plants but they consist of two main types: L. angustifolia (English lavender) and L. latifolia (French/ Italian/ Spanish lavender). English lavender is the most widely cultivated and is well known as a powerful aromatic and widely accepted as a medicinal herb, which produces an essential oil with sweet overtones (V. Hajhashemi, A. Ghannadi, B. Sharif, J. Ethnopharmacology, 2003, 89, 67-71). 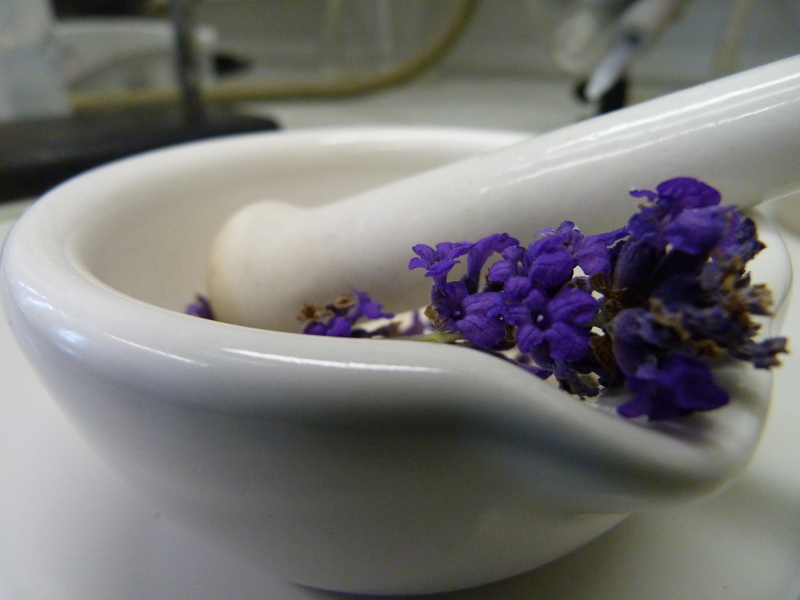 Lavender rests in a mortar, a ceramic bowl, with the pestle, ready to be ground. Lavender is recognised for its beautifully scented blue to violet flowers, which grow in compact or interrupted spikes and sit on silvery/gray, downy linear stalks. The leaves range in height from 9 inches to 3 feet (Ageless). Lavender is native to the lands surrounding the Mediterranean Sea and Southern Europe through to Northern and Eastern Africa and Middle Eastern countries to Southwest Asia and Southeast India (P. H. Koulivand, M. K. Ghadiri, A. Gorji, Evidence-Based Complementary and Alternative Medicine, 2013, 1-10). This drought-tolerant plant thrives in sunny and rocky habitats, yet with English gardeners it still seems to be a popular choice (Royal Horticultural Society, Lavender)! Due to lavenders sweet, aromatic scent, the Romans used lavender for bathing and washing; indeed lavender has been a source of drugs as well as soaps, perfumes, flavourings and crafts since medieval periods. It has been reported as a potential healing herb and is thought to possess antiseptic qualities. Therapeutically, it was widely used as an antibacterial in hospitals in World War I. Today, it is still widely used in a variety of industries. Lavender is predominantly grown for the production of the essential oil of lavender. In most species of lavender the leaves are covered in fine hairs and it is these hairs that normally contain the essential oils. It is one of the most popular essential oils, due to its versatile and is widely accepted as safe for numerous uses. Lavender has been described as helping with depression, insomnia, stress, hysteria and migraines and, even though there is limited evidence to support these properties, many people still use lavender as a medicinal aid today. 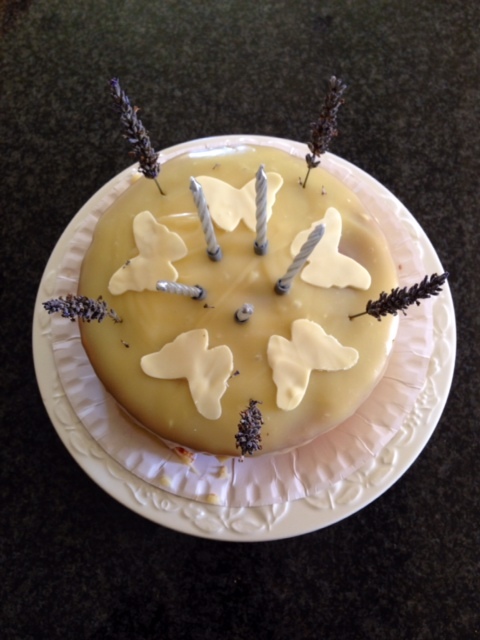 Lavender is also utilised in the food industry where it is principally the flowers which are involved in food applications; for example lavender flowers are used to give a floral and slightly sweet flavour to cakes and deserts. 2) The following chemical constituents make up the principal ingredients of lavender: linalool, linalyl acetate, lavanduol, eucalyptol (1,8 cineole), lavandulyl acetate and camphor. Among these, linalool (35 %) and linalyl acetate (51 %) were identified by gas chromatography analysis as the two main components, although the exact amounts of each chemical component vary from species to species. Gas chromatography is a common analytical technique used in research laboratories. Chromatography techniques generally consist of a mobile phase (in this case an inert gas) and a solid stationary phase (a layer of polymer on an unreactive solid support). The sample to be analysed is injected into the injection port of the instrument and immediately vaporised. It then moves through the instrument to the column, carried along by the flow of the mobile phase. The column is a really long and extremely narrow cylinder containing the stationary phase, through which the vaporised sample passes. The different components of the sample are then separated according to their boiling points and relative affinity for the stationary phase. The compounds detected first have the lowest affinity for the stationary phase and are eluted from the column the fastest. (If you want to read more about gas chromatography, see ChemPages, Laboratory Resources, Gas Chromatography). The functionalised monoterpene linalool, 3,7-dimethyl-1,6-octadien-3-ol, occurs naturally in large amounts in over 200 species of plants, including lavender. It is this chemical compound that is largely responsible for the gorgeous floral scent of lavender, and as a result it is largely used in scented products because of its flowery and fresh odour. In fact it was found to be the most commonly used fragrance chemical in a large numbers of fragrance products, such as perfumes, cosmetics, household products and soaps, which were tested in the U.S. and the Netherlands (M. Skold, A. Borje, E. Harambasic, A.-T. Karlberg, Chem. Res. Toxicol., 2004, 17, 1697-1705. If you are concerned by this report being in a toxicology journal, you’ll be interested in section 3, below). 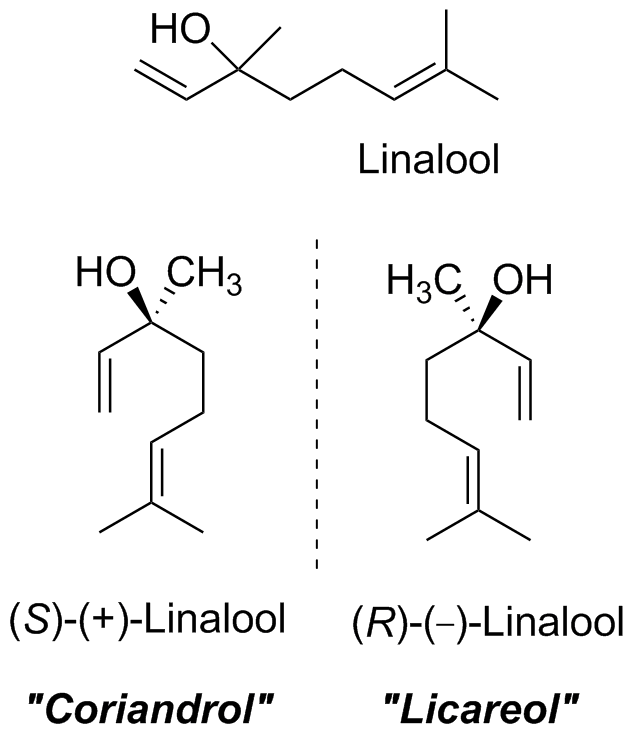 Linalool has two enantiomeric forms which are both found in nature. In chemistry, an enantiomer is used to describe one of two non-identical (non-superimposable) stereoisomers that are mirror images of each other – similar to how your left hand is a non-identical mirror image of your right hand (see also Rose, July 2013). Enantiomers have identical physical properties (such as boiling and melting points). However, enantiomers have different flavour and aroma characteristics (see also Spearmint, January 2014), which is vital for essential oils and flavour. Each enantiomer of linalool will possess a distinct smell, since they will induce different neural responses in the body. To detect the presence of a smell, odorant molecules bind to specific sites on the olfactory receptors in the nasal cavity. Since the enantiomers are arranged differently in space they will bind to a distinct receptor only – similar to how your left hand fits only in the left hand glove and not the right. It is actually the (R)-(-)-linalool enantiomer, also known as licareol, which is responsible for the fragrant scent in lavender. The (S)-(+)-linalool enantiomer, known as coriandrol, is largely found in essential oils of coriander seed and sweet orange flowers. Whilst many of the claimed medicinal properties of lavender go unfounded, the licareol enantiomer ((R)-(-)-linalool), was recently reported to show sedative effects,provoking a decrease in heart rate in a person under stressed conditions (A. Nakamura, S. Fujiwara, I. Matsumoto, K. Abe, J. Agric. Food Chem., 2009, 57, 5480-5485). 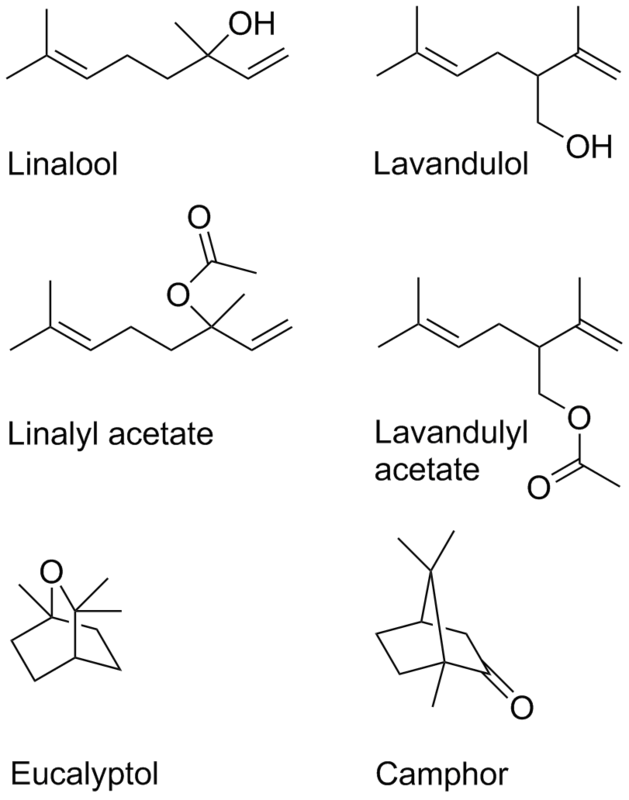 3) Linalyl acetate is an acetate ester of linalool and also an important part of lavender. Due to its pleasant smell it can be used to improve the smell of poor quality lavender oil, in order to pass it off as a superior product (University of Bristol, Molecule of the Month, Linalool). As the mechanism below shows, the acetate ester (linalyl acetate) can form as a result of the reaction of linalool and acetic acid (see also Banana, January 2014). Lavender oil is a vital contributor to the fragrance industry and is used by many people, as it is shows no sensitising effects and therefore is not considered an allergen. However, lavender oil can cause allergic reactions. Terpenes, such as linalool, can autooxidise when exposed to air. It has been shown that, whilst pure linalool is not an allergen, air-exposed linalool is allergenic. The fragrance industry was reportedly worth over $16 billion in 2010 (Fragrance Industry Market Research & Statistics, ReportLinker), therefore, fragrance chemicals that cause allergies could result in many million dollars worth of profit loss in the fragrance industry. Allergen chemicals are already a problem, since approximately 1% of the population in Europe are sensitised to fragrance chemicals (C. Backtorp, J. R. T. Johnson Wass, I. Panas, M. Skold, A. Borje, G. Nyman, J. Phys. Chem. A, 2006, 110, 12204-12212). It is particularly important that scientists understand the chemistry of linalool, as it is one of the most frequently used fragrance chemicals. Investigations have been carried out and show that air-exposed linalool will be oxidised at normal temperature and pressure. As a consequence of this oxidation process, several products were identified, but of these the hydroperoxides were the strongest allergens of the oxidation products tested. In terms of contact allergy, it is linalool’s ability to form these hydroperoxides that is the largest risk associated with this compound. 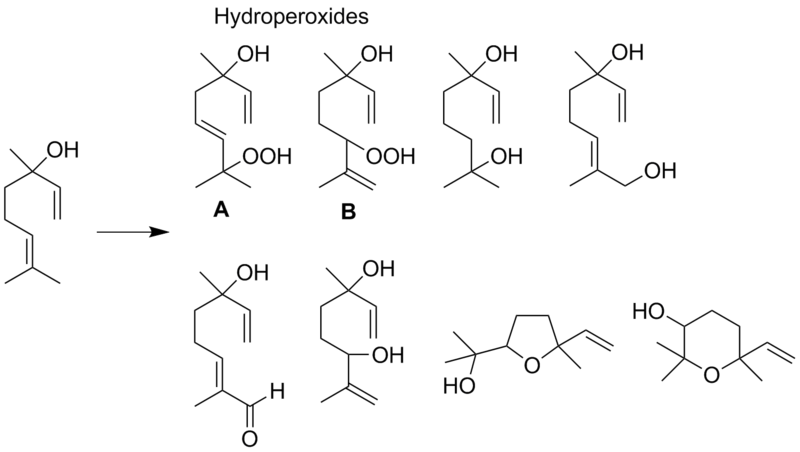 A and B shown in the figure below are the most common hydroperoxides which will form. Generally, a contact allergen will possess electrophilic character in order to penetrate the skin barrier and so will form the full antigen by reacting with proteins in the skin. It is the radical reactive site and the incorporated oxygens in the hydroperoxide which make the oxidation products of linalool potential contact allergens. The pure linalool, on the other hand, is not electrophilic and does not contain any radical reactive centres and hence it does not possess any allergenic activity. So, we see that whilst widely accepted as a safe essential oil for fragrance and medicinal use, lavender oil may not be as inert as commonly believed. Contributors: Lexy Miles-Hobbs (research, photographs and words), Jenny Slaughter (structures and editing). Categories: Allergen, Chirality, Cookery, Food, Fragrance, Herbal Medicine, Medicine, Oxidation, Perfume, Plants, Scent, Uncategorized | Tags: chemistry, chirality, defensive chemicals, extraction, flowers, food, fragrance, lavender, medicine, perfume, scent, science | Permalink.